Waiting for love is a skill. Sometimes it means unraveling all our inner blocks conditioned from early years before we can open our hearts to others. Other times, it means zipping our lips, and centering within, until we can find the kind words to say to another. Unfortunately, many of us were taught love as a “trading behavior” which looks like this: If I do this for you, you will love me in return. I recently heard a woman in a group I attended say she so wishes she could meet her life mate so he could help her with the tasks of running her expanding business. It is nice to get physical support. Two people are often stronger than one. I remember for many years as a single mom, with a large property to care for, craving such help. In fact, “acts of service” is one way people express love, according to the popular book, The Five Languages of Love, by Gary Chapman. Yet, the more this woman talked about her need for help from her physical exhaustion, her pleas for love appeared to be more about seeking a rescue and looking for what she could get, versus give. Coming to love as an empty tank rarely helps us attract right and healthy partnerships. I knew that void very well. In younger years, I used to think someone outside of myself could make me happy. Or, that if I was just “good” I would be loved. Like many other people-pleasers, I exhausted myself trying to prove my value by continually responding to others’ needs at the expense of my own. In the end, that approach wore me out, depleted my resources, and got me sick. I spent a lot of wasted energy tiptoeing around others in fear of rejection. Or worse, I did too much reaching, pleading, and overcompensating by trying too hard to “win” others’ love. Giving away my power in that manner made me a doormat, and sadly, an easy target for others’ anger or disappointment. As I claimed my worthiness and got smarter (or so I thought), I began speaking up. I would no longer live my life as a doormat. My needs mattered, and I was surely going to voice them. I set appropriate boundaries with those who mistreated or misjudged me, or who did not see me in the ways I needed to be heard, acknowledged and validated. With the wisdom of years, and the deep faith journey that helped heal my exhausted body, I’ve learned another technique to deal with others’ unloving behaviors: I now pause, and wait until I can respond with love. The tone of my voice, and others’, has become increasingly important. Harsher tones, often expressed in quick reaction versus a thoughtful pause, seem demanding or judgmental. Criticism and being told what I do “wrong” now make me cringe and withdraw instead of stepping up to the plate like I used to do when challenged. By speaking softly and slowly, even when firmly declaring one’s wishes, we are often heard more. In that pause of “waiting to BE love,” I now try to see the situation through the other person’s eyes. Practicing unconditional love, and accepting others, takes both vigilance and discernment. We can love those who hurt us AND also choose to step aside from the angry darts they shoot our way. When I step aside now, I pray for those who hurt me and honor the space of discord as a time to send and receive blessings. Then, I surrender. I did my part by choosing to center in love. The rest I need to release; I cannot control another’s response. It helps to know another’s “attacking behaviors” often have nothing to do with us. Rather, “attackers” are frequently hurting from a wound of early years, or stressed from a current life challenge not related to us, and they end up projecting that pain onto us, I learned from attending the Loving Groups. I suspect many of us also have been on the other end and played the role of attacker at some vulnerable or stressful moments in our own lives. We all get triggered and sometimes it is easier to blame others than accept responsibility for our behaviors. It takes a lot of patience and strength initially to step aside from others who trigger us and instead center within ourselves for love. The “trigger” can be a family member, friend, significant other or even a telephone or electric company customer service representative who seems incompetent or leaves us on hold for way too many minutes we don’t have to spare. Yet, can you imagine what a more beautiful world we would experience if we began every day with the intention to love all those placed in front of us, and to wait and center within to the love that is our birthright before responding to anything? Waiting for love and pausing requires listening with care and concern, before we assert our needs. Come step into the quiet with me, be heard and seen in powerful new ways, and learn the art of purposefully pausing to expand your heart in love through compassionate coaching. To learn more, please email: [email protected] or call 978–325–1911. 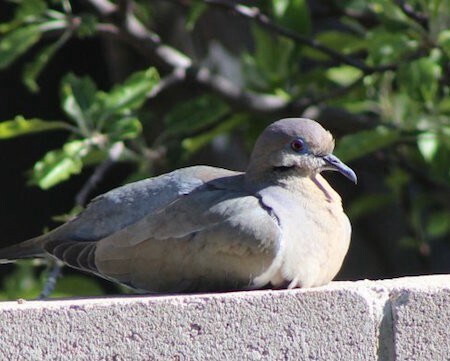 The above photo of the dove “waiting” out the wind while enjoying the warm sun was taken in the backyard sanctuary of my friend Margaret Armstrong’s Albuquerque, New Mexico home. Margaret is an ordained minister with a passion for photography and travel. I am grateful Margaret chose to share one of her latest treasures with us.